Peanut Butter. I absolutely bloomin' LOVE the stuff. Simply can not get enough of it. It does however seem to be a bit of a Marmite food. We have two lovers and two haters in this house. 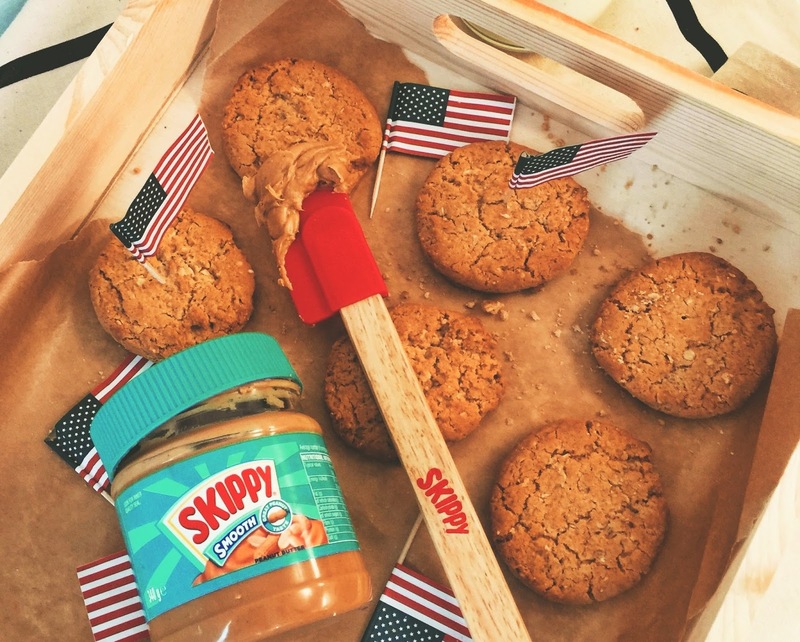 SKIPPY® is the iconic Peanut Butter brand who have been manufacturing in the USA since 1932. I always pick up a gigantic jar of Skippy Crunchy when I'm in Costco. It would be rude not to. Despite not having a particularly sweet tooth I can't resit a PB desert, milkshake, cake or cookie. One of my most popular recent posts has been Peanut Butter Ice Lollies, made with Skippy Smooth and I really must get round to recreating a recipe from my childhood with Peanut Butter, Crunchy Nut Cornflakes and Chocolate. Who says you have to be American to celebrate Independence Day? It’s time to brush up on the national anthem lyrics, brush down your smartest Uncle Sam suit and get ready to enjoy some all American food! 2. In a small bowl, combine oats, flour, baking powder, baking soda and salt; mix well. 3. In a large bowl, beat together butter and peanut butter with electric mixer on medium speed until smooth. Beat in the granulated and brown sugars, eggs and vanilla before combining the flour mixture until fully blended; stir in chocolate chips. 4. On ungreased baking sheets, drop dough by rounded tablespoons 2 inches apart. Bake for approximately 13 minutes or until golden. Transfer cookies onto wire rack to cool completely. Disclosure: This is a sponsored post for SKIPPY®. As always, all views expressed are my own. Recipe and images courtesy of SKIPPY®.Thank you for supporting the brands who make it possible for me as a passionate Scottish Food Blogger to continue to share my Edible Food and Travel Adventures with you. I’m super choosy who I work with and promise to bring you only the cream of the crop. They are probably my favourite biscuit! I often buy them but homemade are even better. This really is the best peanut butter oatmeal cookies recipe! I baked 2 batches last week and they were all gone in the same day! Peanut butter cookies are so good! And perfect for the 4th of July. :) They always remind me of my childhood - such a nostalgic treat. I only discovered Peanut Butter as a teenager. It would have been way too exotic for the North of Scotland in my childhood. Love it! I've never tried skippy but I DO love peanut butter - who on earth could hate peanut butter?! Oh you absolutely must give Skippy a try if you are a PB fan. The crunchy is my favourite. I *love* Peanut Butter too, and I particularly love it *with* marmite! ;-) These looks good, advent made cookies for yonks, really fancy these, thanks! Peanut Butter AND Marmite?! That is definitely a step too far. I love peanut butter cookies, I haven't made a batch in too long. May be time get baking!! So quick and simple to make - disappear too fast though! Mmm peanut butter is so good! These cookies look awesome! I shall come over and join in with Treat Petite. Been rather lax with my linky participation this month! Thanks so much for linking up Claire! I used to hate peanut butter when I was little but now I love it! Peanut butter cookies are one of my favourites and this version sounds absolutely delicious.